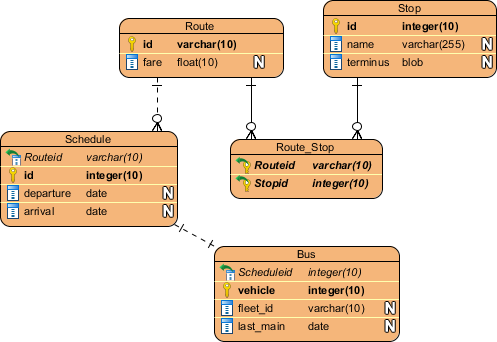 Current: How to Model Relational Database Design with ERD? The Entity-Relationship (ER) model was originally proposed by Peter Chen in 1976. An entity relationship diagram (ERD) is a graphical representation of entities and their relationships to each other, typically used for modeling the organization of data within databases or information systems. Create a new project by selecting Project > New from the application toolbar. In the New Project window, enter Bus Route Management as project name and click Create Blank Project. To create an ERD, select Diagram > New from the toolbar. In the New Diagram window, select Entity Relationship Diagram and click Next. 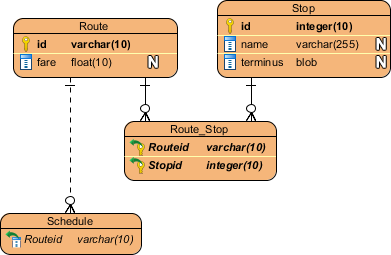 Enter Bus Route Management as diagram name and click OK.
Let's start by creating the first entity Route. Select Entity in diagram toolbar and click on the diagram to create an entity. Name the entity Route and press Enter to confirm. Create columns in Route. Let's start with a primary key. Right click on entity Route and select New Column from popup menu. Enter +id : varchar(10) and press Enter. Note that the + sign means that the column is a primary key. Varchar is the column type and 10 is the length. Enter fare : float and press Enter, then Esc to create another column. Create entity Stop. A bus route has many bus stops, while a stop can be shared by many routes. Therefore, there is a many-to-many relationship between Route and Stop. Place the mouse pointer over the Route entity. Drag out the Resource Catalog icon at top right. Release the mouse button and select Many-to-Many Relationship -> Entity from Resource Catalog. Name the new entity Stop, You can see that a linked entity Route_Stop is automatically created in between Route and Stop, with foreign key added. A route has multiple bus schedules. 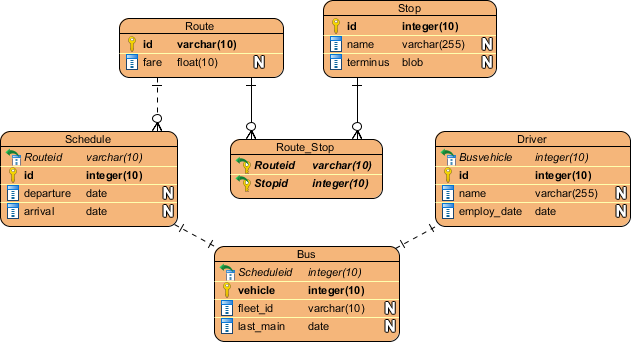 Create an entity Schedule from Route with a one-to-many relationship. Move the mouse pointer to Route. Press and drag out the Resource Catalog icon. Select One-to-Many Relationship -> Entity to create entity Schedule. This is the final ERD. While teaching an information systems analysis and design course, I reviewed over 20 CASE tools which supported UML. Visual Paradigm was by far the most intuitive and comprehensive.